This unusual Tibetan buffalo-bone mala necklace is made from 108 x 9mm beads. Hangs 12-inchs - 24-inches long in all. Although these prayer beads are similar to the latest fashion accessories, they carry a far deeper significance in the Buddhist culture. Prayer beads, or mala beads as they are called in the Buddhist religion, represent a meditative tool. Their purpose may vary, but commonly the beads are used to enhance 'goodness' and diminish 'toxins'. Driving away evil and filling you and all beings with peace and bliss. Buddhism teaches that this material object is used as an accomplice for gaining merit on the path to enlightenment. The origin of mala beads is the Hindu religion. Individuals who converted from the Hindu faith to Buddhism during its birth, transferred this devotional practice with them and it soon became a part of the Buddhism. The story of the beads' origin is "Sakyamuni, the founder of Buddhism. He taught king Vaidunya to thread 108 seeds of the Bodhi tree on a string, and while passing them between his fingers to repeat... 'Hail to the Buddha, the law, and the congregation'... 2,000 times a day. Another interpretation of this prayer is 'om mani padme hum', repeated over and over according to how many beads are on a person's mala. There are 108 beads on a strand of mala prayer beads, because it represents the number of sinful desires that one must overcome to reach enlightenment or nirvana. Monks usually have mala beads with 108 beads, where as a lay person may have a strand numbering in 30 or 40 beads. This difference in length may possibly be explained by understanding each person's distance traveled on the path to enlightenment. Just as variety exists for the number of beads, color and material can be different. Typically, monks' mala beads are made of wood from the Bodhi tree. In Tibet, mala strands often contain parts of semi-precious stones. In this culture, the most valued strands are made of bones of holy men or lamas with 108 beads divided by 3 large beads. The end pieces on these strands are "djore" (a thunderbolt) and "drilbu" (the bell). Representing the Three Jewels, or Buddha, the doctrine, and the community. 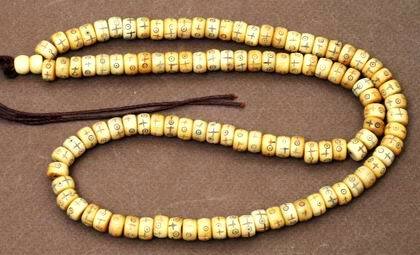 In China, mala beads was never really popular - mainly used by the ruling hierarchy as a status symbol. The overall purpose of all mala beads is to create a sense of tranquility and inner-peace for not only the individual, but for the community as a whole. In reciting the prayer, 'toxins' will leave and a sense of peace will enter making an individual that much closer to reaching nirvana. This Chinese water-buffalo bone mala is made from 108 x 11mm carved bone beads. Long - almost 40-inches in all!